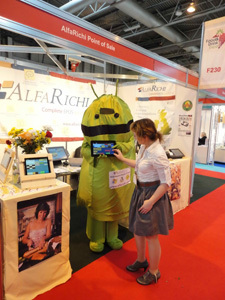 At the end of March 2012 we had a stand at the «Food and Drink» exhibition at the NEC Birmingham were we were mainly presenting our point of sales software working on Android touch tablets. There was a huge interest in our product and we took quite a number of potential customers’ and partners’ contacts. 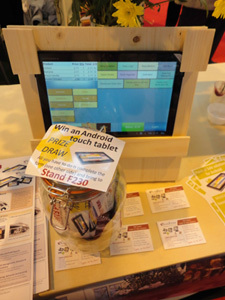 As well as on Android touch tablets, our software was shown on touch screen terminals with Windows and Linux OS and also on a brand new all-in-one Casio VX-100 POS terminal — first ever point of sales terminal running Google Android operating system and we are proud to have our software running on it. 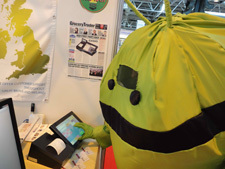 We had our «big green friend» (as people were referring to him ) Android walking around and inviting people to come to our stand and take part in the prize draw to win an Android touch tablet. All the people coming to our stand were nice and friendly and we were wishing good luck with the price draw to all of them, but unfortunatly only 1 can win and we were wondering who it was going to be..? After 3 days of the show we went back to our office with all the leaflets, put them in the big lucky box and… voila.. HERE IS THE NAME OF THE WINNER! George Creasey from UFP packaging in Leicecster. Very warm congratulations to you, George, and thank you to all of you who had time to visit us there — we really enjoyed the show as we enjoy every day working so that your businesses will grow sucessfully!